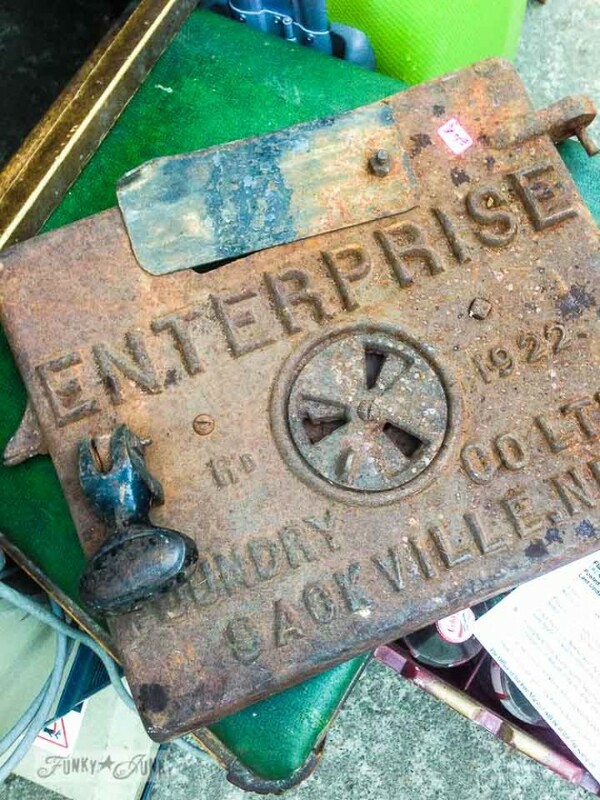 What would you do with these salvaged finds? There’s this New and Used place just down the road from me. It’s a little shop that offers everything under the sun. I love to peek in there every now and then, just in case I find that special something. And being that the bathroom reno is in high gear, I was hoping for a little rusty bling of some sort to dress it up down. 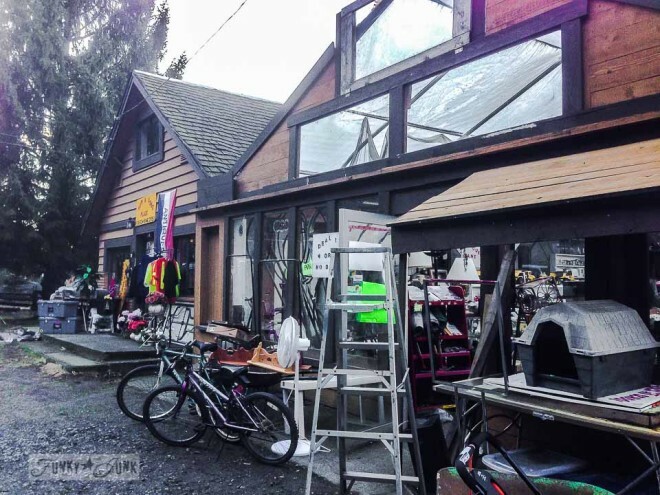 I went in there today, and when the owner spotted me, he knew exactly what I had come in for. He excitedly showed me the ‘new antique isle he made. He created a rusty old antique isle and gave me the personal tour! I was touched. 1. 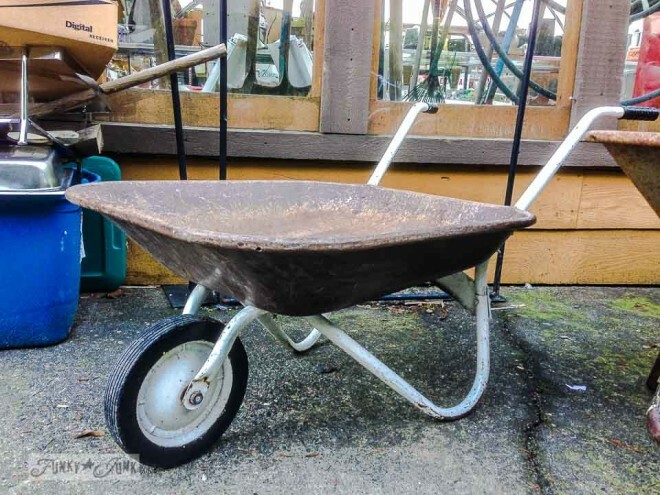 Wheelbarrow / since it’s too big for the bathroom, I’d love to hang this on an interior wall or fill it with flowers in the summer. I LOVED the rust with the white and black. It was magnificent. Dang! Now I want it more. 2. Rusty tub / I’d LOVE to make an outdoor pond with a babbling little water fountain! But should there ever be a next house? I want one of these for a tub. Imagine. That would read ‘redneck chainsaw.’ It’s already got an important task so we’ll leave this one alone. 3. Insulators / I’d love to illuminate a row of these somehow for patio lanterns. 4. 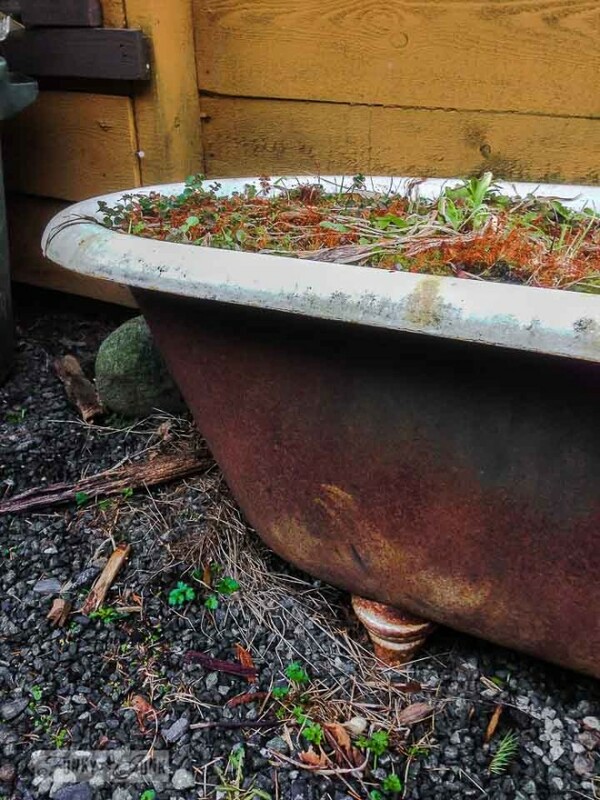 Old rusty tub / it would be fabulous to punch out the bottom and just use it as a different level in a flower bed. Now I want it! 5. Wood framed glass door / it’s gorgeous! I’d layer it in front of a window that could use a little privacy. Or just allow the sunlight to stream in. Hmmm…. might have to go back and check the price. 6. Old clock / it’s kind of got a diner feel to it to me. It would come in mighty handy by my blog desk though with those red numbers! I need to figure out how to set my blog without that setup so I can quit counting my fingers. 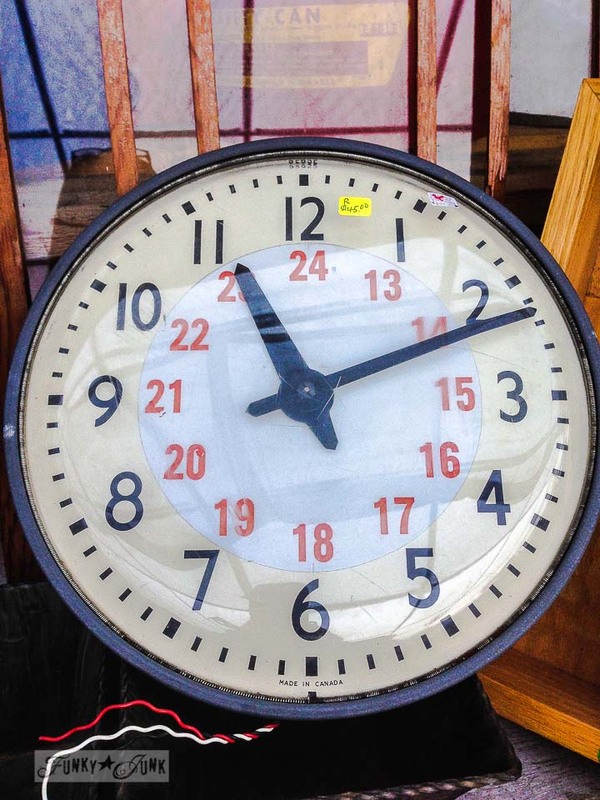 Anyway, I think this clock would look awesome in a warm white vintage filled farm kitchen. 7. Gas tanks / I always love these but never know what to do with them. If weighted down, they’d make neat lamp bases if you were handy with a welder. I don’t know. Any ideas? 8. Funky hooks / I loved it but it was so curved you couldn’t even hang it right. Still thinking because I really loved how quirky it was. 9. Green bar stool / plant stand? 10. These rusty hubs were cool! They would have made the perfect hanging mood lights in some corner. But boy were they heavy. 11. Wood burning stove door / I’d just lean this somewhere because I like the look of it. I mean, it was REALLY heavy. Then again, everything rusty metal is heavy. If I buy this stuff, I’d actually have to learn how to mount stuff properly. Until then, I can handle the lightweight rusty metal category just fine. The funnel and handle came home with me. 12. Rusty funnel / I could see a whole collection of all different sizes of these guys and hang them as lights floating group above my blog office desk. I want more! 13. Metal handle / maybe on a cabinet… hmmm… in the bathroom perhaps? 14. Rusty mattress spring / please be proud of me. This was on the curb on the way home and I was a good girl and left it there! Don’t you dare give me ideas for this.. you know how weak I am. And it isn’t old, right? I’m sure it’s new… RIGHT? Ugh. Pictures you take home with you are dangerous. 14. 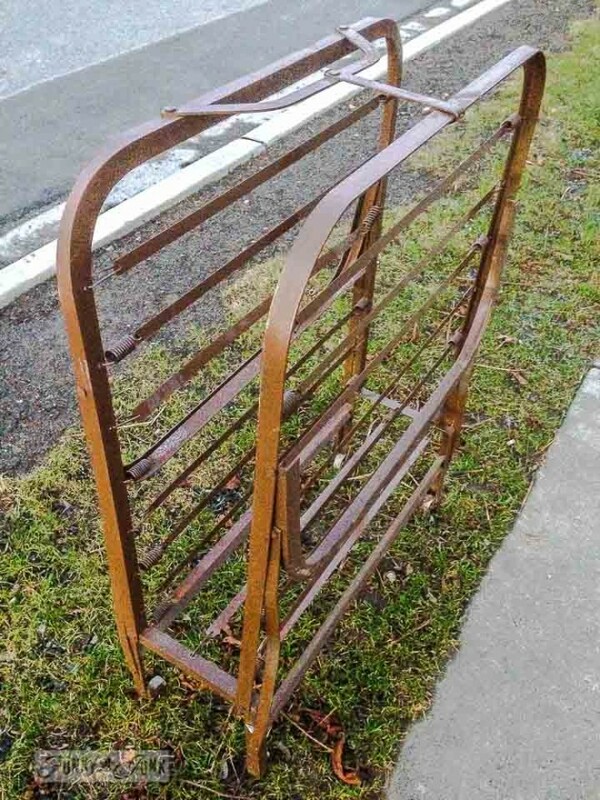 Rusty bedspring / take apart and hang it on the kitchen wall for pots or kitchen utensils. 6. Vintage clock / ? 10. Rusty wheel hubs / They’re great. Bases for lamps maybe? That was fun, Donna :)! Have a wonderful and junky weekend! I wish I could say I am as creative as you but I can’t but I thought I would share what I came up with for a few of the items. Could the insulators be put on a board to hang your coats on instead of hooks. 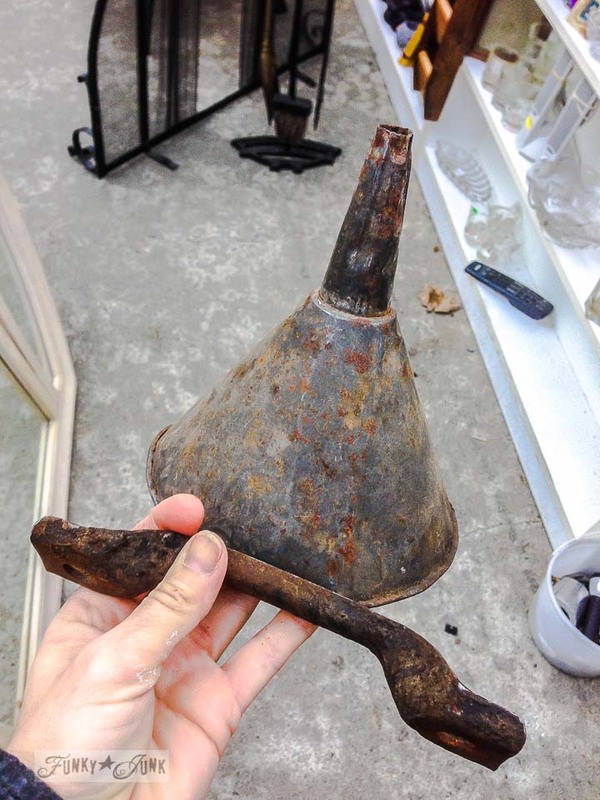 Rusty funnel put in a planter with a plant that hangs down and put the funnel in with a different plant in it. Old Rusty tub put something colorful behind rusty bottom and hang as wall art. I would use the two rusty hubs to create a bench, them being the base, and use a chalk-painted and distressed board as the seat. The funnel would make a charming lamp shade. The insulators would look nice lined up with a Christmas light under each one and at the edge of the patio or deck where you want some soft lighting. Ok, I could probably come up with something for many of those things but the first one that jumped out at me was the bed spring! It looks like a great “sheet wood holder” for the garage! I have something similar (in smaller, non rusty size) in my kitchen that holds my sheet pans. You could also use it as a garden tool holder if you put hooks on either side on the cross arms… And those hubs would look great as water fountains in that rusty tub! Funky hooks / add a rope behind it as a hanger and hang up…leave it as is…hang something interesting on those hooks..
Love it! We always used old metal wheelbarrows/masons pans as outdoor fire pans before pans became trendy. That rusty bed spring bed is going to haunt you because you left it there!! A freebie, I see two bulletin boards, Just remember, You can always throw it out again. Loved the tour! The rusty bed…if there was a way to get rid of the rust or seal it. I would use this for all my flat work and media. Would be easy to go through. Sort of like an open file cabinet. 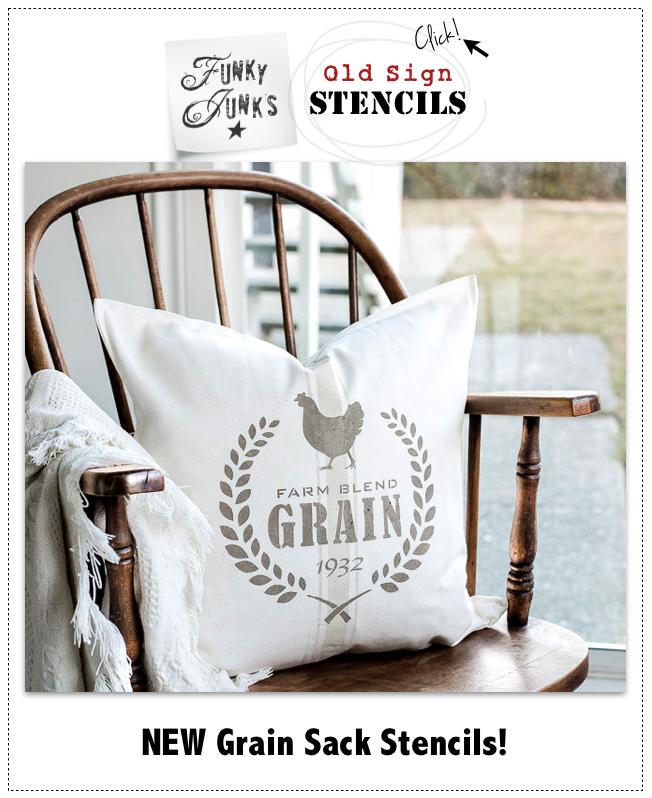 Of course I already have storage for this, but am so darn addicted to rustic. The door is a keeper, definitely find a use for it. If all the glass is there my use would be a pretend storm door on the house. If not all glass, absolutely a screen door from my kitchen. I’d make a lovely tiny water garden! It would make a wonderful water garden! I’d spray with glow in the dark paint and use them on a garden path! Add some weathered barn wood and they would make great side table’s in a Man Cave! especially is he’s a car enthusiast! Displayed in my Hubby’s Man-Cave Garage! In a craft room I’d use it to showcase different fabric remnants I have! Recovered in cowhide and used in my rustic Kitchen! I might use the insulators as “hooks” on a homemade towel/robe rack. 4. Round rusted out tub / Lucky you! You won’t have to punch holes in it! 8. Funky hooks / I’d hang this upside down from chains, and hang pots & pans from it. 9. Green bar stool / Set it on a base, recover, and have a swivel vanity seat! Not sure if my first list went through, but I forgot one, so I’m resending! Lucky you!! The large clock I’d mount on tray legs/base and make a mini table. The large round tub already has a huge hole – planter, definitely. Go for the pond with the bathtub!! The lovely window I saw in front of your towels in the new bathroom. The funky hooks, I’d hang upside down from chains, then hang pots & pans from them. The bar stool I’d mount onto a sturdier base, recover, and use as my swivel vanity seat! 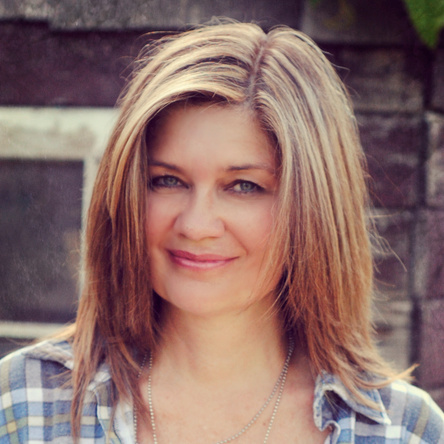 Donna – here are some of my ideas! Keep in mind that I have a garage full of stuff that I have yet to act upon. It’s soooo much easier to tell someone else what they could do – LOL. 7. Gas tanks – when you think of what to do with these, let me know. I have several in my stash! 8. 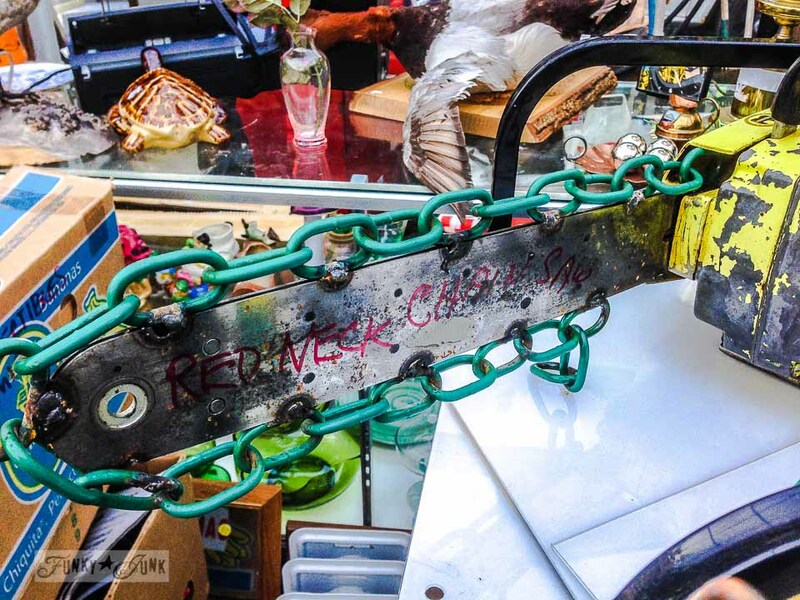 Funky hooks – just hang it from a chain attached to each end with rusty eye hooks. That one is too good to pass up! 9. 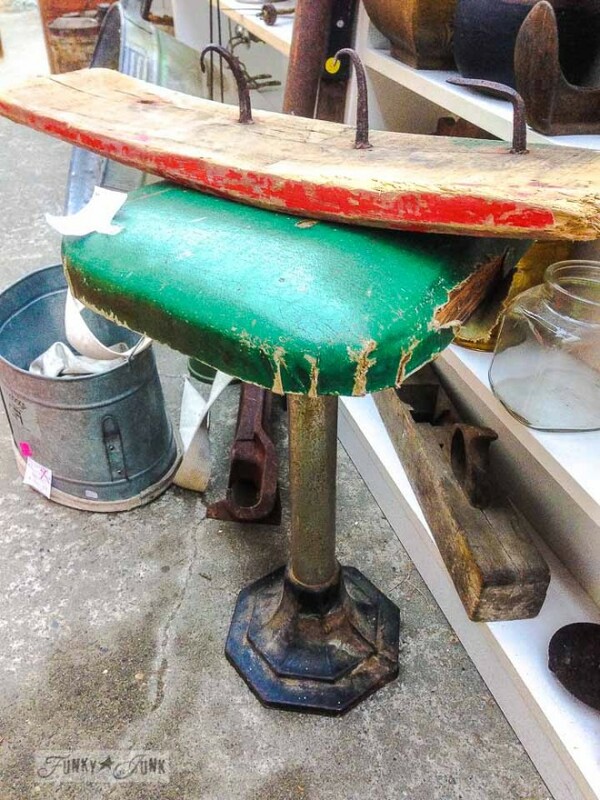 Green bar stool – oooh, I need this in my craft room, mounted on a wooded base with casters and just recover the seat. 10. 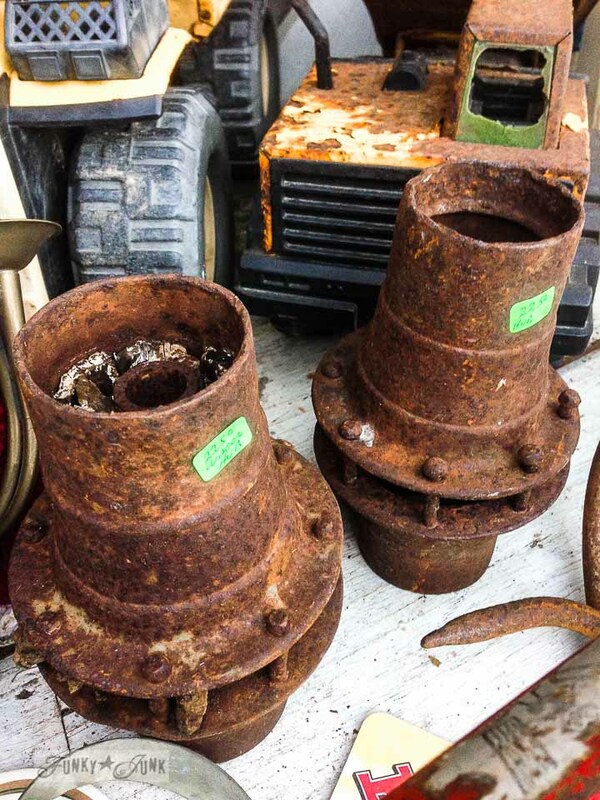 Rusty wheel hubs – Those are your floor lamp bases! Mount them on butcher block with casters so you can move them around. Or cut a hole so that the bottom narrow part just sits in the hole, since it would be kinda hard to attach them to something. OK, I am a gardening geek, so most of this stuff would go in my yard – lol. Insulators – I have mine on the screened in porch rail and on a metal shelf over the window on the porch. 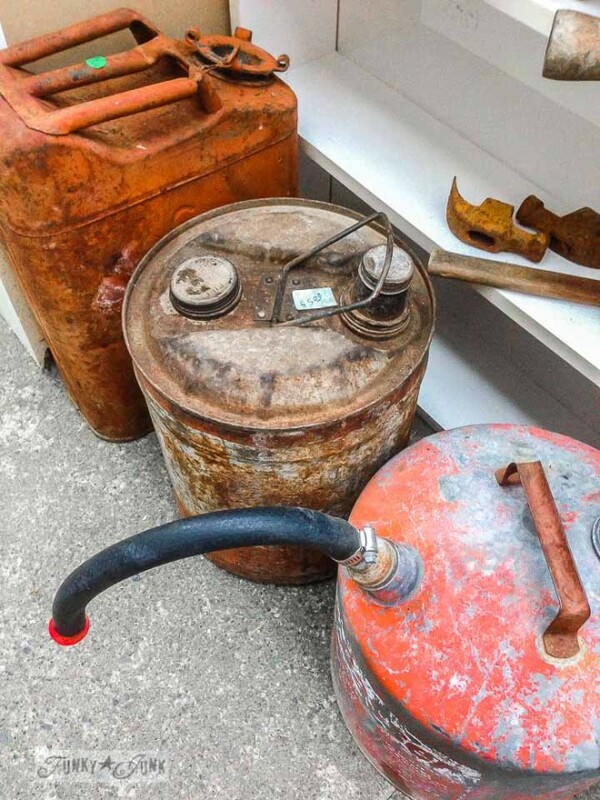 Gas Cans – I have an assortment of these sitting in the flower bed next to my husband’s workshop, along with an old hammer head and an old sledge-hammer head. 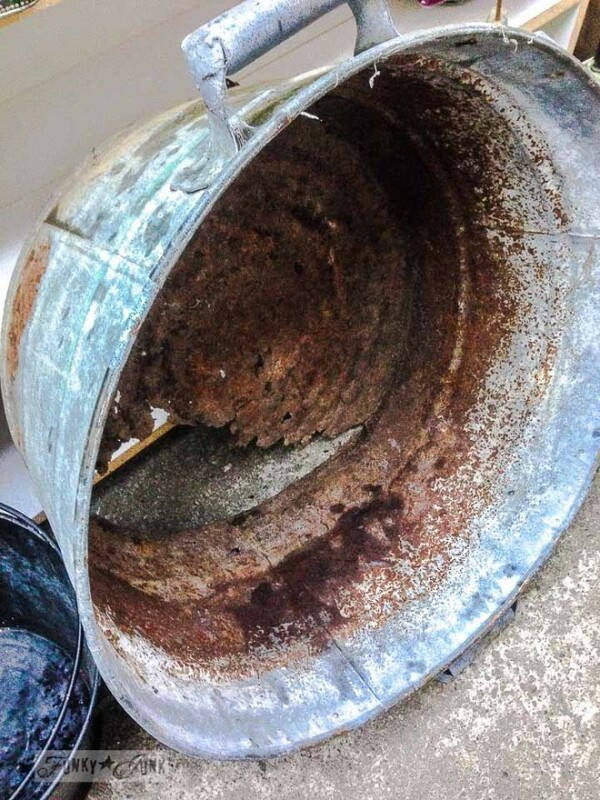 Rusty wheel hubs – a base for an outside table or a metal bowl for a bird bath. Could be a plant stand too. Aww, I came to the party too late! In life, that is. I have begun my “decluttering” campaign in my home now that I’m moving in on 66 yrs of age… having all this stuff around is just too much any more. 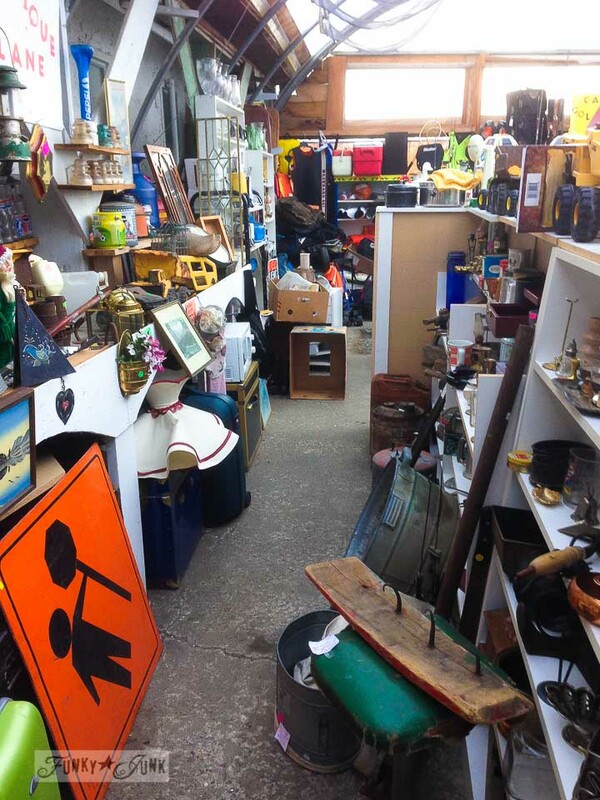 Your “aisles” of funky junk look like a lot of fun to roam through. I don’t know of a place near here (north of Boston, MA) like that. Enjoy it all while you are still young. Time has a way of flying right by when you are least expecting it! I’d hang the glass insulators wrapped in wire upside down and put tiny plants in them – herbs and small flowers. I think along a fence all in a row would be cute. That door! I can see it on a pantry. Or as a divider in a bath to semi hide a toilet. Or as the back of a hall tree with hooks for coats. Find something to attach to the front bottom for sitting or storing umbrellas… or something. It’s just too pretty to leave there! Go back and get that bedspring thingy and make a rolling bookshelf out of it. Like the Restoration Hardware salvaged bookshelves that look all Frenchy with reclaimed wood shelves. It’s already on rollers! Hurry! I love playing this game Donna! 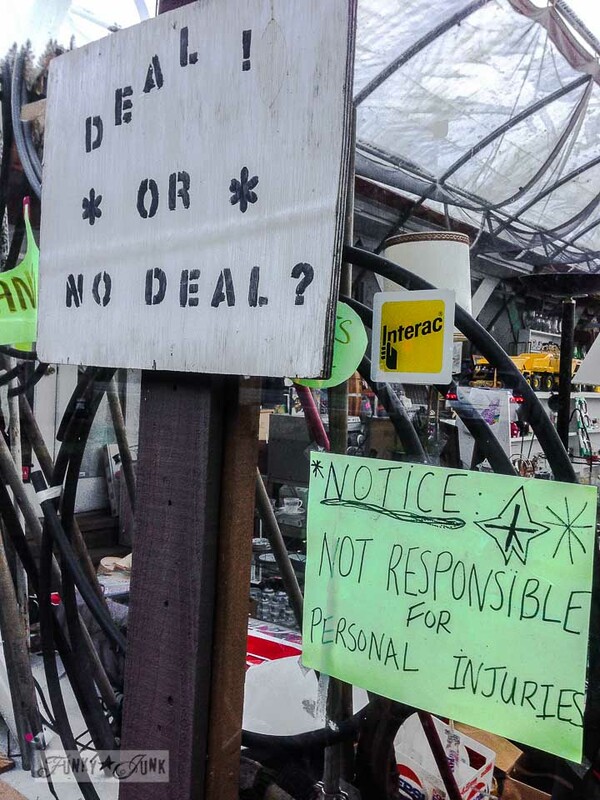 It would be fabulous garden junk for me! 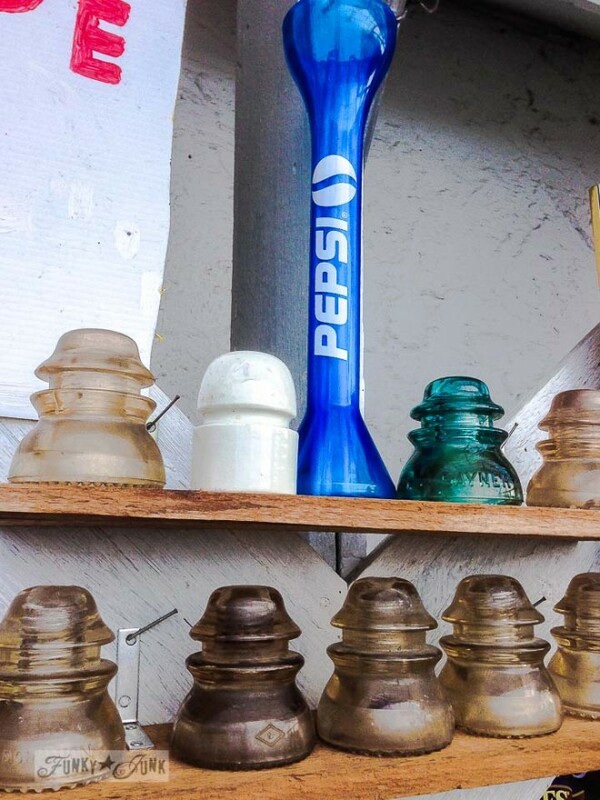 Insulators / I’d love to illuminate a row of these somehow for patio lanterns. I have a bunch and would be really interested in seeing these done! So, you found an isle of delight in an aisle at the junk store. Looks like a great place. If you could get the hide-a-bed that you left along the road apart, you might be able to use some of the pieces for towel holders once they were sealed. GirlinAir.com shows how to make insulators into pendant lighting. Love the variety of colors and styles at the shop you visited. Variety in color would make it even more interesting if they were hung over a bar area. I think that the one you left (Bed) I would use on the patio and as a lawn chair. The bucket under the green stool, I would use that as a waste basket in the bathroom. (I know you didn’t mention it but just a thought.) The rusty handle definitely in the bathroom. 12. Rusty funnel / That is someone’s head in a garden sculpture. Will need more rusty parts to complete the sculpture. Rusty mattress springs – great for a trellis in the garden, don’t you think? Old bar stool – I would DEFINITELY cover it with zebra material and paint the stand black – I’m into zebra material for some reason lately. 1. Wheelbarrow /3 choices, place glass on top for table, line with plastic table clothe and place ice in with a bunch of beverages for a party, or flowers tipped out or straight up. 2. Rusty tub /Seal the rust. bring inside and make a fish tank with glass table top. quite a coffee table. 3. Insulators /rusted bed spring with candle in springs, or I also thought of the small battery candles inside. 6. Vintage clock /I have spent some time in the ER lately, that is a hospital clock. Cool but I do not want to think of the ER. 7. Gas tanks /Although they are cool I would only use the one I could use as a plant stand or glass top side table out side. These are hard to fine and selling for $$$$ with boaters. 8. Funky hooks /In the shed with tools hanging on them? 11. Wood stove door /in the fireplace in the summer for interest with some c candles. soaps in it so it squirts out the bottom. added bonus you can wheel it in the garage if it rains and your towels are still dry. 11. Wood stove door / Find Dr. Spock and give that back to him for his starship. 13. Rusty handle /Nothing, I don’t like that handle unless there were a couple more of ’em. 14. Rusty bedspring /Take it apart and use the springs for something. Insulators / Drill a hole in the top and install wiring for lighting. Hang several from rusty vintage egg basket (sealed) for repurposed chandelier. Would look great hanging from my patio canopy above our outdoor dining table. Wood framed glass door / I’d have to paint it, distress it. I would mount to the top side of my potting station made out of vintage chippy door. 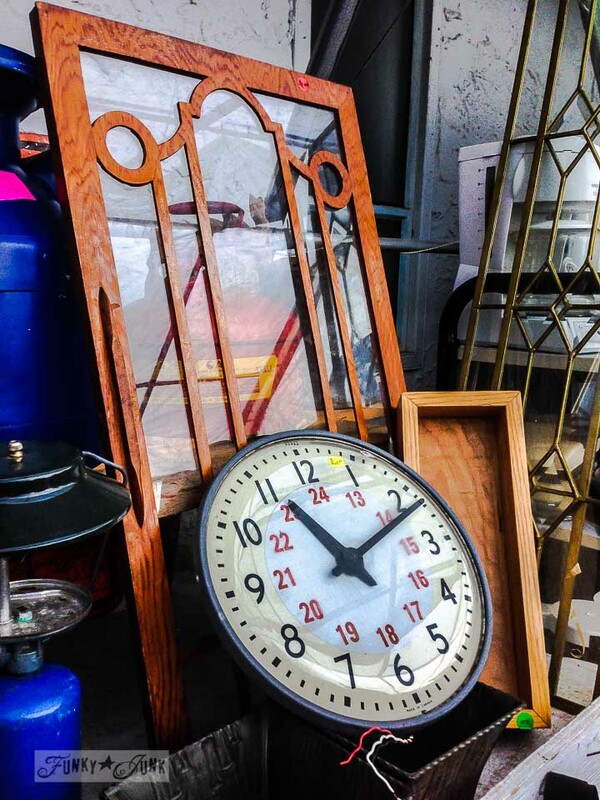 Vintage clock / I would add this to my “wall of clocks” with the other vintage shop and school house clocks I have. Funky hooks / Stencil “hooked on junk” in red (vertical) and distress lettering half off and mount. Wood stove door / I would remove the handle and use as one of my stepping pavers (stones) leading to the garden. This was fun. Thanks Donna for making me dream of Funky Junk tonight! 7. Gas tanks / I saw one of these made into a neat birdhouse. I think it was in Birds and Blooms. the rusty claw foot tub would be resurfaced and go in my bathroom!!! I lost my house (old, full of vintage things)in Katrina. Am grateful to finally get a new home but it is a cookie cutter with the character of white bread! Most of my things were lost so I dream thru your site….someday. I do love your ideas. 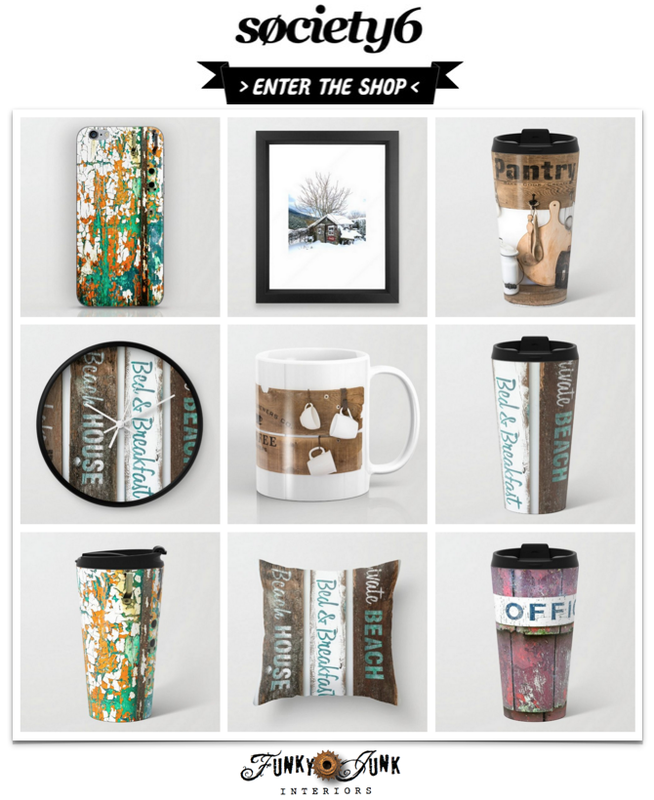 I love that shop! i would totally hang the rusted bedspread over my bed and use blankets and drapes of material to create a canopy! You left it there? Wow! That takes some serious self=control!! 3. Insulators- use UV glue to construct a pyramid and add a table lamp kit. 5. Wood framed glass door-this looks cabinet sized. This one says tabletop to me, or maybe on a chest as a lid. Or just hang it as is. 6. Clock-kinda like it as is. 7. Gas cans-if you want to make them into stand lamps, maybe fill them partially with cement, and let it set with your upright in it. Seal it after if it smells. 8. Board with hooks- take hooks off, and combine those with the rusty handle, and you have a set now. The board says seat to me: garden or small bench. 10. Wheel hubs: because of the scale, I’d put them on a workbench/counter with a glass shelf on top, for extra storage. If you put wood on top, you can’t see them. 11. Wood stove door-kinda stumped. I like the paving stone idea. Maybe take a rubbing of the lettering and frame that. 13. Rusty handle- add to a piece of furniture with its three new friends from above. Use one side of the fold up rusty bed springs for hanging on the wall, maybe in a mud room or by a door. Hang different baskets from it to hold stuff, mail, gloves, etc. Hooks for keys. What do you think? 1. Wheelbarrow – I have one leaned on a fence and a lovely clematis has bloomed on it several springs/summers…unintentional (but still lovely). 3. Insulators – We had a small collection and finally took some Dollar Tree solar lights apart and managed to get the ‘guts’ to work inside the insulators and they now are in several potted plants along our driveway…they look really neat…and easy and cheap! That’s all I can get a visual on right now…maybe I would have grabbed the old folding bed you left on a curb…another cool something to let a vine climb on…and then it would be a true ‘FLOWER BED’! Hi there, I wish for to subscribe for this webpage to obtain newest updates, thus where can i do it please help out.